A new technique, developed at ANSTO's Centre for Accelerator Science, has made it possible to produce some of the first reliable radiocarbon dates for Australian rock art in a study just published online in The Journal of Archaeological Science Reports. 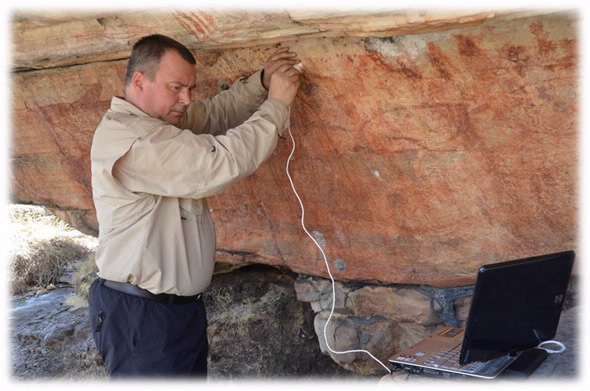 The approach involved extracting calcium oxalate from a mineral crust growing on the surface of rock art from sites in western Arnhem Land, according to paper co-author research scientist Dr Vladimir Levchenko, an authority on radiocarbon dating using accelerator mass spectrometry. Levchenko, who supervised the radiocarbon dating, collaborated with lead author of the paper, Ms Tristen Jones, a PhD candidate at the Australian National University (ANU) and co-authors from ANU. 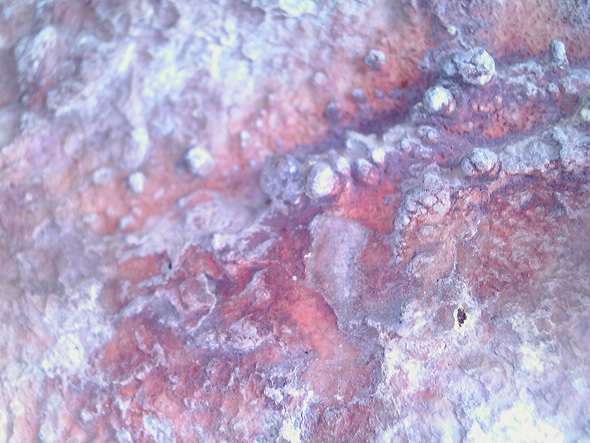 Generally speaking, radiocarbon dating cannot readily be used to date Australian indigenous rock art directly, because it is characterised by the use of ochre, an inorganic mineral pigment that contains no carbon. The paper authors explain that carbon found in the mineral crusts on the rock surface was most probably was formed by microorganisms. "These microorganisms are photosynthetic bacteria, like cyanobacteria or algae, which can utilise carbon from the air normally, and are active through wet periods," said Levchenko. One of the peer review authors who reviewed the paper prior to publication predicted it could become a benchmark for studies of this type as it addressed a complete lack of chromometric data for rock art in Australia and elsewhere. Another reviewer called it the most significant rock art and dating paper to have been produced in Australia for over 25 years. The approach has produced an upper and lower limit of dates for a regional art style known as Northern Running Figures (NRF) or Mountford figures, believed to have been produced in Australia during the early to mid-Holocene (10,000 – 6,000 years ago). The archaeologists suggested the maximum age is likely to be far older. The limited distribution of the NRF style and its unclear relationship to earlier and later art styles has posed challenges for rock art researchers. "With the ages we acquired using carbon-14 on our Antares and Star accelerators, we showed effectively that the age ranges hypothesised for the NRF art style are generally correct," said Levchenko. 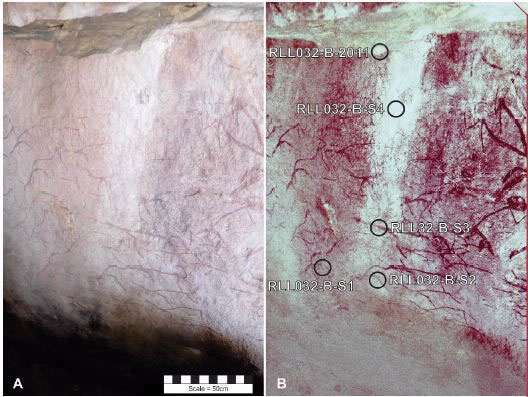 Jones et al report that the minimum age of the NRF rock art style (based on the oldest sample) is reported to be 9034 – 9402 BP (before present), which also produces a minimum age for other art styles that occur in the 'Middle Period' sequence. Jones said "the results are exciting as although they generally support the chronology and assumed antiquity for the NRF art style, they provide minimum ages which suggest that the art style is actually a few thousand years older than what was anticipated. They also demonstrate that the art style was painted over a considerably long period. Most excitingly the results also provide the chronometric data to support a Pleistocene antiquity for the earliest known figurative art styles, such as Dynamic Figures, in Arnhem Land." "The figure depicted in the painting cannot be younger than the growth upon it," explained Levchenko. Although there have been similar approaches in other studies they used only single samples, in our analysis we reported on nine samples from paintings from two Arnhem Land archaeological sites," said Levchenko. They have overcome problems with an approach first proposed and tested by archaeologist Dr David Watchman in Australia in the 1990s, who tried to do the radiocarbon dating using the bulk of the crust. "They didn't have the sensitivity of our instruments at that time and they were criticised because the undistinguished bulk could produce wrong ages," said Levchenko. 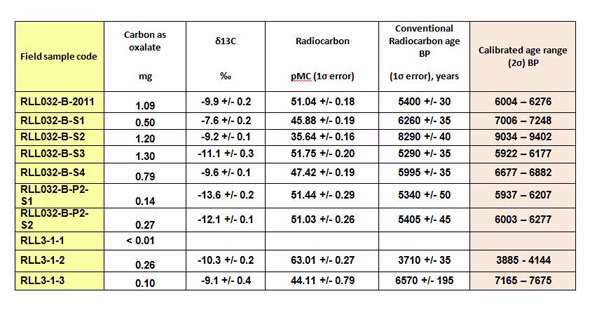 The authors expect determining the radiocarbon ages using only the calcium oxalate minerals, greatly improves the accuracy. 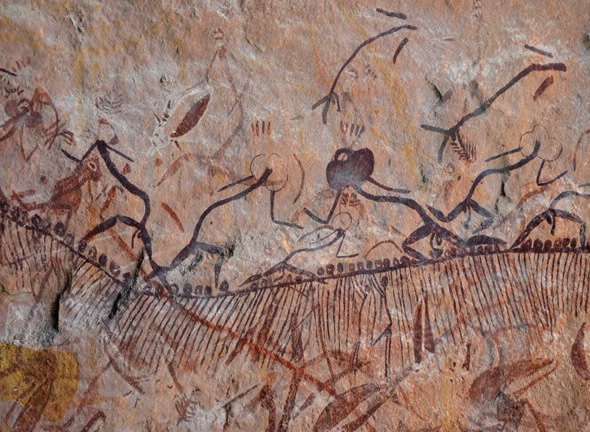 "Indigenous Australian rock art is very interesting, it is believed to be among the most ancient in the world but it is one of the least dated," said Levchenko. The research had the full support of the local Manilakarr Clan estate in western Arnhem Land and is the result of a long term collaboration with Ms Jones and other ANU collaborators with the Njanjma Rangers and the Djabulukgu Association. Senior Traditional Owner for the Manilakarr Clan estate Mr. Alfred Nayingull was a co-author on the paper. But I'm already seeing someone.